Kampala was getting me down and to avoid the smog, dust, noise and smell of rotting cow horns, I made an impulsive decision to head to Jinja for the night. We decided to stay at an island called The Hairy Lemon, a place I heard spoken of many times. 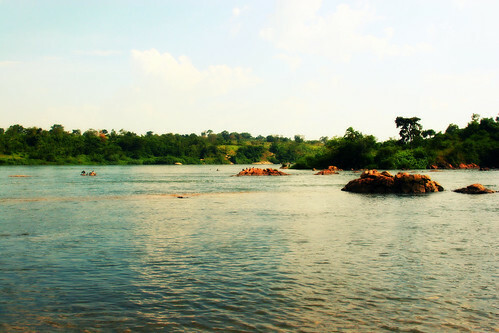 It is a small island about 60km upstream from Jinja and is famous for being very quiet, a great place to Kayak and having an excellent campsite. Paying heed to my inner princess I decided to sleep in a Banda ( a small, basic, concrete house ) rather than camp in a tent. Despite the positive inroads I have made in my relationship with a tent, I have decided that I will only sleep in a tent if there is no alternative. The Hairy Lemon is well known for its vegetarian food and coupled with the fact that I was longing for some silence, I thought this Lemon, hairy or not, would be just the ticket. The drive was a little over 2 hours. Imagine this distance on a wide and smooth highway in the Shiny West and it could have taken 45 minutes. Much of the drive was pot holed or involved hurtling over rough speed bumps placed at foot long intervals. I spent most of the drive thankful that I was wearing a bra and singing Grease songs at the top of my lungs. I arrived hungry and excited for my mini break. A small dug out canoe takes visitors from the bank to the island, a ride that is only minutes long, but makes the arrival seems quite romantic. The kids, like wild dogs let off a leash took off at some speed to run and explore the island. The family we were with, who shall for ever after be known as the Super Campers, unloaded their tents and marched up the hill to set up camp. ( They are ALL Trooper with no Princess in sight, hidden or otherwise.) These are friends who always carry snacks, always have the right gear, always have chairs to fold out and sit on. They put me to shame. Anyway…. The afternoon passed well, despite the barely edible lunch. The vegetarians amongst us, who had, I presumed, been expected, were served food where the meat had quite obviously been pulled out. Husbands napped, wives read, children frolicked in the rapids, it was all calm, quiet and restorative. Dinner was quite simply inedible. We dined, instead on chocolate and either coke or wine, ( age appropriate, if nothing else) and worried about where we could brush our teeth with no running water around. The toilets were all long drops (exactly as it sounds, it drops a long way down) and strangely, whereas they hadn’t bothered me in the slightest in Bunyoni, here I was irritated. I had left Kampala for some peace and quiet and I was finding the gag inducing toilets and lack of warm showers very annoying. Still, at least I wasn’t in a tent, I thought, as I prepared for bed to the sound of rain pounding the tin roof. Sometime during the night I began to feel it. The stinging sensation that comes from being bitten by something very very mean. It was not a mosquito as there was no buzzing accompaniment, and mosquitos tend to drift away and then return to munch on a different place. I was being bitten from the top of my thigh, all the way down. In the morning I discovered a dozen large, swollen welts. I am convinced there was a large, hungry Safari Ant in my bed. Eager not to appear too much like a Princess in front of the Super Campers, I tried hard to smile and laugh about the toilets and joke about how we could always shower at home, but inside I was fuming and dying to return to my little house. The very same house, that I had called boxy and was so intent to escape just 24 hours before. As we came home, and how sweet home felt, I made a decision. I will not go anywhere for the weekend unless there are flushing toilets and warm showers. I will indulge my inner princess and no longer push her away in shame. I am what I am and I have the itchy thighs to prove it. I’m on a bit of a mission at work. It has long been a point of fact that I have zero tolerance for any type of bullying. This includes any of that mean talk that kids indulge in, including notes passed in class with petty slanders about the girl in the corner. I believe passionately that no child should have to suffer in silence and if more teachers made it their personal mission to stand up and say no then the frightened victims would finally have someone on their side. Too often educators turn a blind eye to the cruelty of children and teens, stating that it is “just a phase”, “I wouldn’t know what to do”, “it will pass”, “it is all part of natural selection” or God only knows what else. I feel no shame in the fact that I was bullied. Occasionally I search for reasons why it was me that was relentlessly picked on and I come up with the idea that perhaps I was different from the others. I spoke with a different accent, I wasn’t allowed to wear make up or go to see movies like Endless Love or Blue Lagoon. I spoke off the cuff, tried too hard to have friends…. I have no idea what combination of facts led to me being the IT girl for those girl’s nasty behaviour. I do know that while I was pinned down at a sleep over and rubbed all over with lip sticks that stained my pajamas, that there was nothing I could do to stop it. The other day in PSHE ( personal, social and health education) I combined both Year 7 ( grade 6 ) classes to discuss this very subject. I told them that I would not tolerate any unkindness of any sort and that what they might deem funny could, in fact, be very painful to the person involved. I also told them about the importance of the bystander and witness and how powerful a role that person plays in stopping the meanness. I explained that I knew how hard it was to be a snitch and tell on someone and for that reason they could, at any time, drop a note on my desk explaining anything they had seen. Bullying is not rife in my school by any means. It is a small school where every one knows each other and I don’t believe that any one of my students is particularly cruel. However, things do happen as I was soon to find out. I handed out sheets of paper to all 40 students and asked them to anonymously write down anything they had seen or done. Reading these notes later made me quite sad. One boy was pushed into the gym shower where three other boys turned the tap on soaking his clothes. One person confessed to breaking into a few lockers. Someone else explained how they had passed mean notes in class. Simply the act of writing these facts down helped to make these 11 year olds realize the little cruelties they were inflicting on their classmates. Since that PSHE class I now have a reputation for being a fighter for all students who feel excluded. My door is always open to any one who feels slighted and they all know that I will always be on their side. Just the other day I received note from a sweet young girl who is certain that none of the girls in her class like her. She wrote a litany of examples of times that she was excluded or sniggered at. I will invite all the girls involved into my class room for a chat next week. Once they realize that some one is watching, someone who refuses to stand by and allow meanness to exist, maybe they will think twice. I am not a fool and I know too well that girls between the ages of 11 and 15 can be extremely unkind. I also know that I cannot change this fact, but I can let the victims know that some one has their back. I will not stand by and do nothing, at the very least for those kids who have the bad luck to be the chosen targets. The Official Top Ten List of Why it is Cool to Live in Africa. 10. Excellent fruit and vegetables. They grow everything here and the pineapples are particularly exceptional, and fresh all year round. 9.We are always surprised. Going for a simple drive to the supermarket can turn into quite the adventure. You have no idea what will appear around the next corner, but I assure you, it will be surprising. 8. Full time inexpensive help, We have a fine woman who comes to our home each day to hand wash our clothes. iron our sheets and mop our floors. This is a cheap but lovely luxury. For a bit more money we could also have another fine lady come over and cook our meals. This might happen in the near future, if I have my way. 7. There is no need to ever do any sort of manual labour. Ever. Need a shelf drilled to the wall? No problem. Need a pair of bedside tables to be custom built? No problem. Need your house painted? No problem. Need a tailor? Done. Anything can be done and the price is always low. 6. Excellent free education for both Princess and Trooper. Courtesy of yours truly who walks into that fine institution and teaches every single day. Perks of the job baby! 5. Wonderful weather. It is really the best climate a person could wish for . It is never too hot, never too cold, yet cool in the evenings and warm enough to lie by the pool on a Sunday afternoon. 4. The proximity of extraordinary places to visit whether for a long weekend or an extended trip. There is the best wildlife in the world virtually on our doorstep. 3. Decent restaurants, a movie cinema and high speed internet . Inexpensive fresh roses sit on my dining room table every day, my furniture is handmade and there is a decent bookshop. The supermarkets are full of wine and nutella, what more do we really need? 2. A good social life and plenty to do. If we wanted to we could be out all the time. There is a robust group of expats from all over the world ready at a drop of a hat to drink Beaujolais Nouveau, toast Haggis, dance at a ball, raise money for a worthwhile cause or simply meet for a good Thai meal. There are always people to meet and they are people that you would never, in the course of a regular life back home, run into contact with. Often when I watch my girls around the pool I think to myself that with their friends they resemble a mini United Nations. 1. And the number one reason why it is cool to live in Africa? Everyday we are forced to question the way we see the world. Our preconceived notions are constantly thrown into the air and we never stop learning. A family of four, all tucked neatly behind the driver. That makes five. A woman breast-feeding while riding a Boda Boda, neatly zipping between a truck and another truck. Two chickens, alive, tied to the handle bars. A goat, very much alive, and not very happy, tied by the legs, upside down and hanging from the back of a Boda. Very sharply dressed traffic policeman. They were dressed all in crisp, pressed white; held a whistle and a wooden palette with which they were directing traffic. I say, who needs traffic lights if these people dare to get themselves between one dusty truck and another? With a wave and the occasional beep on a whistle these fine men and women rule the roads. Dead dogs and plenty of them. I have taken to wondering, each time I see a dog sleeping, if he is actually alive, or very much dead. It is not a question I enjoy posing as we speed over the pot holes. Fish hanging from the fenders of cars. They are attached by string to the metal bar on the front. It seems this is the choice way to carry fish home and I imagine it reduces the fishy smell in the car but it certainly may add an aroma of smog to the taste of the fish. This is not an uncommon site yet one that leaves me bemused every time. Many shops called Obama. There is an Obama Grocery, an Obama Hairdresser, and Obama Restaurant and an Obama Fruit Shop. Do you think he has any idea? Downtown in the centre of Kampala where you would find the worst traffic jams there are men who walk between the cars selling a assortment of things that would defy the imagination. When was the last time that, sitting in your car, you suddenly realized you needed a wall map, or a pair of shoes, or a game of Scrabble or even a steering wheel cover? Mosquito zappers, board games, carpets and rain coats are offered beside cell phone car chargers, phone airtime, sneakers and peanuts. It is best to put up your window if you prefer not to shop since any one of these objects may be pushed into the car and dangled under your nose. I have worn heels exactly twice in 8 weeks and it was agony every time. The walk from my class room to the staff room involves staircases, long walks past plants and seemingly miles of hard stone floor. My room is cold tile. There is no chance of a tootsie touching that floor. No. Until I discover the eternal quest, that of the search for the comfortable yet pretty shoe, I will keep wearing my Birkies. I recently purchased my third pair on line; they are black patent and you over there please take you hand off your forehead. It is ok. I am still me. Yet not wearing the cute dresses, any more. You see the only clothes that go with Birkies are long skirts, comfortable tops…. Where is the glamour? Get me to Top Shop. Quick. Been busy with my faithful Canon. Shutterbug I am.